Spring is finally here and I am so excited for the flowers to bloom! Flowers have the ability to make everything happier and brighter. Luckily, one of the biggest trends to hit the runways this season is head to toe floral. Designers are showing the prints worn from head to heel, mixing floral tops, skirts and even shoes of different floral patterns together. Flowers are very feminine and fresh, but wearing head to toe floral while pregnant may not be so easy or flattering. If you do decide to wear a floral dress or top (which I think is great!) I recommend going for a bigger floral print in darker colors. If that's not your thing, don't worry, there are other ways to enjoy this trend. One great way to incorporate this trend is by adding floral accessories. 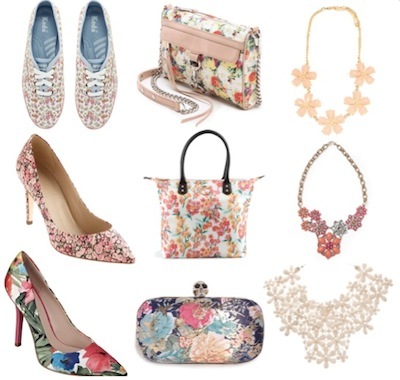 A floral bag, shoe or necklace can brighten up your look and is a perfect way to spruce up your daily wardrobe. The botanical look can be sleek and sophisticated or fun and and super cute. During the day wear a cute floral sneaker with jeans, a button down top and a faux fur vest. If you want to mimic the runways, wear a floral bag with this outfit to get the head-to-toe look. At night, trade your sneakers for a mid or chunky heeled floral shoe with a simple swing dress, leather jacket and fun floral earrings. It’s easy to fall into the habit of only wearing black and monochromatic outfits while pregnant. If you want to have a little fun with your everyday look and add some color, this floral trend is perfect. It’s fun to look outside the box a little bit and have fun with your look while you are pregnant.